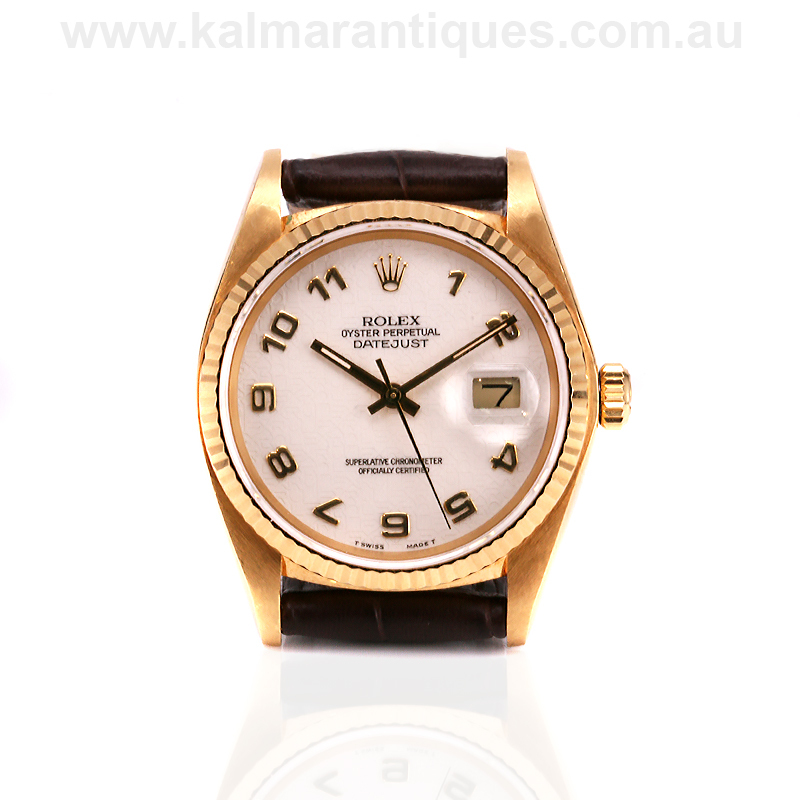 Product code: W1134cc Categories: Sold Items, Sold Rolex Watches. Perfect for day or night comes this very stylish 18ct Rolex Datejust with the rare Jubilee dial reference 16018. 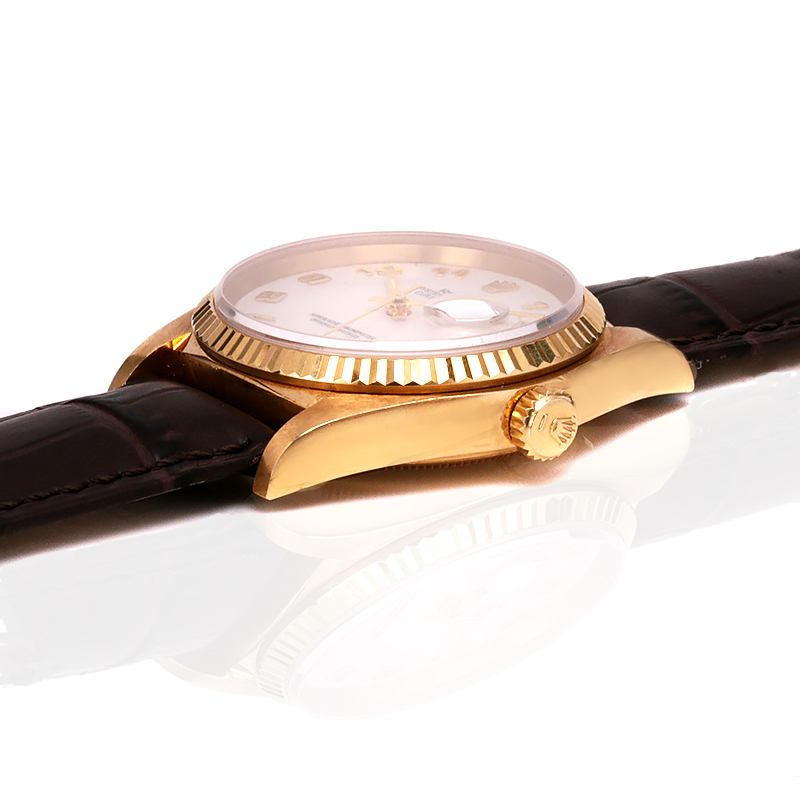 The Jubilee dial is also known as the computer dial, and is one where the word “Rolex” is repeated across the entire dial in the same tone leaving a very elegant look to the watch. This subtle and very attractive feature is not often found on many Rolex dials, making it one of the more sought after versions to have. Made in solid 18ct yellow gold, the jubilee dial displays numerals giving it a very clean and sleek look to it and fitted with the fluted bezel adds that extra character to the watch. With its original Rolex sticker still on the back, this shows just how little this watch has been worn. Measuring the iconic 36mm across plus the Rolex screw down crown, it is fitted on a leather band that will easily allow this watch to be dressed up or down no matter the occasion. With such an elegant look to it, combined with that gorgeous jubilee dial, there is no doubt that this Rolex will always be admired. Inside is the robust 27 jewelled automatic Rolex calibre 3035 that runs perfect and comes with our twelve month warranty, and with the watch fitted with the sapphire crystal, all of this makes this such a perfect Rolex watch for any occasion. This is such a fine example of a solid 18ct yellow gold Rolex Datejust with the highly sought after Rolex jubilee dial that will always be enjoyed and admired on the wrist. Tag: 18ct Rolex Datejust with the rare Jubilee dial reference 16018. 18ct Rolex Datejust with the rare Jubilee dial reference 16018. The Rolex Datejust has been an iconic model of Rolex since it was introduced in 1945 and is as popular today as when it was first made. The Rolex Jubilee dial is also known as the Rolex computer dial, and is one where the word “Rolex” is repeated across the entire dial. This subtle and very elegant feature is not often found making it one of the more sought after Rolex dials to have.